I spent an unreasonable amount of time researching and buying a running watch. I ended up with a Fitbit Ionic Adidas Edition and would have recommended it if only it did what it advertised. My Ionic’s GPS dies consistently at 7-10 miles. The only workaround is to restart your run. See this post and this post with dozens of people complaining. While Fitbit support recommends restarting the watch before each run, which doesn’t fix anything, I recommend buying another watch. Bluetooth range is horrible and wearing the watch of my left hand works extremely poorly, constantly cutting out and glitching, with a pair of bluetooth headphones with a receiver in the right ear. See this post. While Fitbit support recommends wearing the watch on the right hand, I recommend buying another watch. Fitbit is not fixing any issues, but is creating a ton of new ones. Firmware updates are bricking watches and frustrate lots of users. See this post about the 32.12.19 firmware release. While Fitbit support recommends doing a factory reset to recover from a failed firmware upgrade, I recommend buying another watch. Maybe Fitbit will fix these issues one day. Ignoring that, the Adidas edition is a must for any Russian that wants to stay on brand. I used an armband for over a year with my iPhone. The armband got very worn out and it felt like throwing money away to get a new one. Annoyingly, it left a sweat mark on my arm or long sleeves when running in cold weather. It was also inconvenient to start Strava before a race through the armband’s plastic, or having to put the phone away before strapping the armband on. Finally, everyone I knew who ran regularly had a running watch, giving me some serious FOMO. I wanted a watch that had GPS, could sync with Strava, play my favorite music and support payments. I also originally thought I wanted it to receive and send text messages. Finally, the watch needed enough battery life to last a marathon, which I am running in New York in November. It really sounded like Samsung Gear S3 would fit the bill. It had GPS, could sync data according to Strava, had a SoundCloud app, supported payments and had cell service that would work with messages of all kinds. I bought the watch and returned it promptly within 48 hours. Nothing worked with an iPhone. The iOS app was crippled to a point of being useless. I couldn’t sync to Strava because the Samsung Health app on iOS didn’t support external applications. I couldn’t install Soundcloud Pro because the Gear S3 app on iOS didn’t even list paid apps. 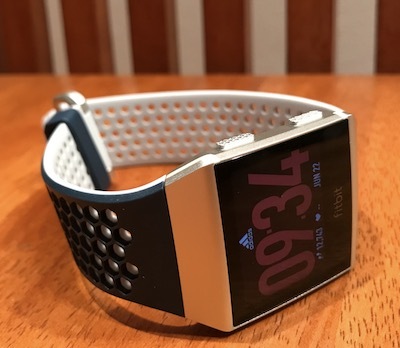 I bought the Fitbit Ionic Adidas Edition and kept it. I did try to return or exchange it months later, but it was too late. Fitbit support agreed to make an exception, but I haven’t bought it directly from their website because I am Russian and wanted the Adidas version. Lesson learned. This watch has GPS, Strava, music and payments, but no cell service. This review changed my mind about needing to have a phone on me. In hindsight, I really enjoy focusing on my run before, during and especially after. I used to fiddle with my phone to upload the run to Strava or take selfies instead of what I should have really been doing - stretching and rolling. Setup and the firmware upgrade are pretty slow, but work. The watch sees my 2G WiFi and not anything faster. The iOS app is fine. I wanted either di.fm or long tracks from Soundcloud. I learned that to sync music with the Ionic you needed a computer, which was odd but survivable. I downloaded some SoundCloud tracks onto my laptop and spent a while looking for a way to just copy MP3 files to the watch. The process is actually much more bizarre as the Ionic Mac app only syncs iTunes playlists with the watch, so I had to add the MP3s to iTunes, then choose which playlists to sync. That works well, albeit slowly. The watch easily connects to my bluetooth headphones and plays music. 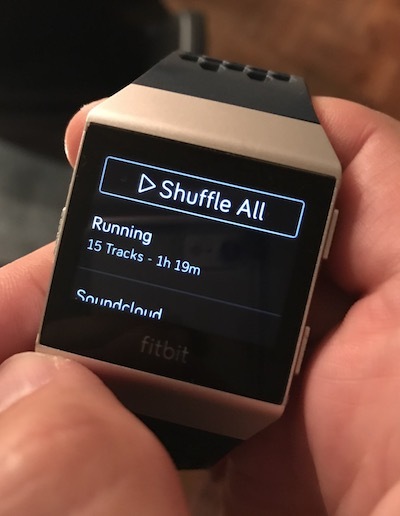 It will cut off often for a split second, and will cut off a lot in a crowded race if you wear it on the opposite hand of your bluetooth headphones receiver. See this post for details. I went running with OSR on Tuesday and started a warm-up run from home. The watch froze. I didn’t have a phone to lookup how to reboot it, and eventually figured out that you had to press and hold the left and bottom buttons. I tried again after a restart and the GPS showed a laconic Connecting for the entire mile. Was it broken? I was very unhappy, but OSR ran at 8pm sharp and I just had to stop fiddling with it. After about half a mile the watch suddenly acquired a GPS signal and worked for the remainder of the run. I later learned that GPS has a cold start and needs to download some local satellite data. This usually takes 15 minutes in the dense New York city. The watch now acquires GPS in about 30 seconds. Ionic GPS fails at around 7-10 miles. See this post. I installed the Strava app on the watch, connected it on the iPhone, and saw my past runs. It quickly turned out that this app was totally useless and confusing because it didn’t sync anything from the watch. To sync my runs I had to go to strava.fitbit.com and authorize Fitbit with Strava through the website. The Fitbit + Strava app then showed up in my settings. 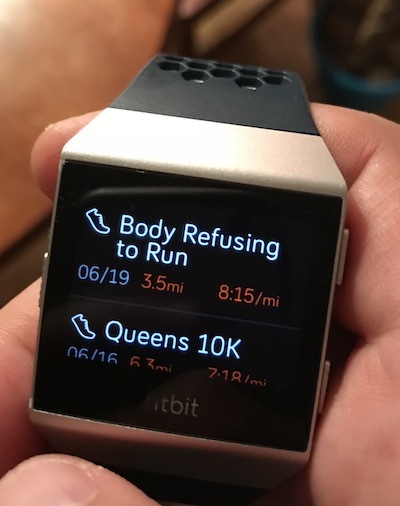 Runs upload to Strava a few minutes after the watch syncs with the phone. This works. Payments worked flawlessly with an American Express card at the Walgreens in Union Square to buy me a Gatorade after this morning’s 9 mile run. Anything involving money clearly got a lot of attention. 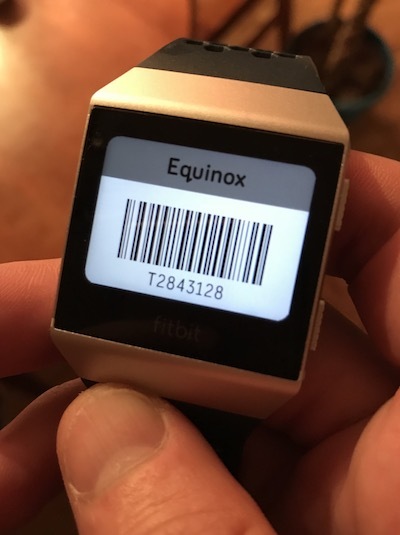 It was nice to find a barcode app on the Fitbit. I ran to the very hip Williamsburg Equinox without carrying ID. With the display always on, GPS and playing music the Ionic ate roughly 40% of the battery in a couple of hours. I wore the Fitbit at night and got a nice looking sleep tracking chart that broke down REM, Light and Deep sleep. I really like it! This one was definitely an option and had all the features. But it’s a watch, not a running watch, and I wouldn’t buy it out of principle. I wear a real watch, a Panerai Luminor Marina. The Garmin Forerunner 645 Music seemed to be a slightly more advanced version of the Fitbit Ionic for an extra price. I haven’t tried it, but heard great things. There’s a newly released Garmin Vivoactive 3 Music that matches closely the specs and is similarly priced to the Fitbit Ionic. I would have bought this one today, but I haven’t tried it myself. 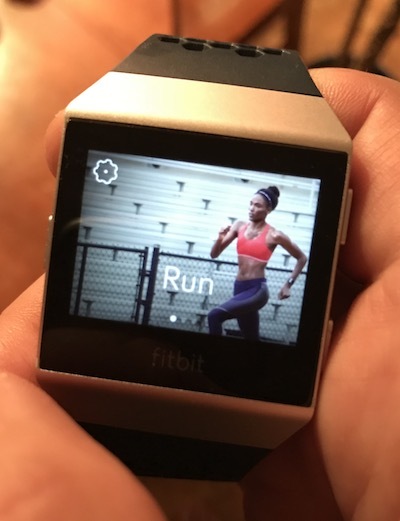 Upgrading to a Fitbit Ionic Running Watch was published on June 22, 2018 . See a typo?